Comprehensive urban functions are important symbols to realize basic modernization. During the 12th Five-year Plan period (2011-2015), Nantong development zone will accelerate urban infrastructure construction and strengthen the supply of production facilities. It will make efforts to cultivate a new Nantong with complete functions, rational distribution, convenient transportation facilities, with an eye to preserving ecology, and creating a harmonious society. Nantong will become an ideal place for living and business. The development zone will further optimize the spatial arrangement by following the overall plan of “advancing with two cores and developing along three axes” (i.e., take Nengda business district and Suzhou--Nantong science and technology industrial park as the cores, and develop along the axes of Xinghu Avenue, Tongsheng Avenue and Dongfang Avenue). The south area will develop into a new functional city center on the Suzhou--Nantong science and technology industrial park. The industrial park includes a fine chemistry industrial park and Tonghai harbor district. Honggang scenic area will be regarded as an ecological separation belt, expanding the southern quarter into a new functional area and develop into a gateway to embrace Shanghai and southern Jiangsu. Eastward movement will be typified by moving Nenda Business District and lead priorities from the central road quarter along Xinghu Avenue to the east. In this way, Nengda business district will develop into a large-scale functional quarter integrating administration, business, R&D, commerce and daily living. By leaning against the north, it will draw the northern part of the development zone closer to the eastern quarter of Congchuan district, the municipal administration center, university town, and sports convention and exhibition center. This will cultivate a secondary center of the development zone circling around the livelihood logistics park of Tongfu Road. By optimizing the west, it will improve the efficiency of utilizing the shoreline resources in the constructed Fumin harbor district and Jianghai harbor district. It will improve spatial relations with Langshan hill scenic area, and gradually adjust and open up the industrial land along the canal and turn them into livelihood projects. II. Improve the transportation network. The development zone will improve the trunk road network towards other parts of the province, including No.336 provincial highway, riverside high-grade highway and Zhangjiang highway.The expressway network comprises three east-west roads and three north-south roads (the three east-west roads are Tonghu Avenue, Xinghu Avenue, and riverside high-grade highway. The three north-south roads are Tongfu Road, Dongfang Avenue and Zhangjiang Road). 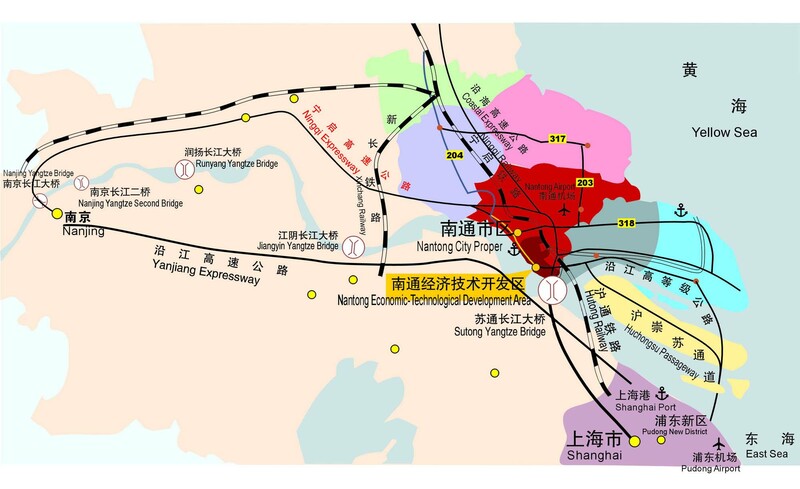 It will speed up construction of the railway bypass for Jianghai harbor district, and the inter-city hyperchannel connecting Suzhou—Nantong science and technology industrial park and Nengda business district, with downtown Suzhou and Nantong. The waterway classification of the new Jianghai River and Tongqi canal will be elevated. The development zone will scientifically plan the 21.4km Yangtze River shoreline and give priority to the construction of the Tonghai harbor district. The development zone will further improve plans for supplies of water, electric power and heating, and sewage treatment in the region. The construction rate will be speeded up and supply capacity will be extended. In response to the 20-hectare Langshan waterwork branch under construction, Honggang waterworks with a daily capacity of 600,000 cubic meters will be expanded, connecting it with Langshan waterworks branch along Tongsheng Avenue to form a circular water supply network. Daily handling of 105,000 cubic meters in the first sewage treatment plant and 250,000 cubic meters in the second sewage treatment plant will be put into practice. These two sewage works will develop independent sewage treatment sub-systems. The voltage of electrical cables across the river southward from Dongfang Avenue will be raised to 1,000KV and will be connected with the southern Jiangsu grid. A 500KV transformer substation at Xinfeng will be set up to the northeast of Nantong Farm. Two hectares of land will reserved for the construction of seven 200KV transformer substations, make it into a regional trunk grid. It will keep eight existing 110KV transformer substations, relocate the Tonghai 110KV transformer substation, and upgrade the Zhuhang 35KV transformer substation, to make up a high voltage distribution network. The turbines of Nantong Meiya thermal power plant will be upgraded to bring the heating capacity up to 660 tons/hour, expanding the second thermal power plant of Jianshan Agrochemcial Co. Ltd. to 400 tons/hour. Together with the thermal power plant of Dongli Synthetic Fiber (Nantong) Co. Ltd. and the two plants of Johny Weiss thermal power Co. Ltd., it will be able to supply 1,210 tons/hour heating to the region by 2015, with 460 tons/hour at plants with self-supplied facilities. IV. Construct characteristic industrial parks. The development zone will spare no effort in the construction of the 10 industrial parks with unique characteristics. Successful experiences from the China-Singapore Suzhou Industrial Park to introduce advanced planning and management geared to international standards will be utilized. Construction of Suzhou Nantong science and technology industrial park will be accelerated. Nantong development zone will plan a 50 square kilometer area to develop the industrial park into a high-tech and comprehensive Jianghai eco-town and international innovation park, which is ecologically friendly, internationalized, integrating the functions of production, living, trade and residence. Meanwhile, Nantong development zone will use lessons learned in cooperation between Jiangsu and Singapore, and become a new economic growth center in the Yangtze River delta area in 10 to 15 years. The development zone will display the policy and functional advantages of Nantong export oriented processing area and the only region in Nantong under special supervision of Customs. Nantong development zone will give priority to developing manufacturing industries of new energy, electronic information, and bio-medicine, and construct a regional R&D center. It will also become an international procurement and distribution center, modern logistics center, testing and maintenance center. A bonded logistics park for exports processing will be constructed, displaying a leading role in the bonded logistic network in central Jiangsu province. The development zone will work hard to boost imports and exports to the value of four billion U.S. dollars by 2015, including three billion U.S. dollars for export and one billion U.S. dollars for import. Existing Sci-tech Industrial Park, precision machinery industrial park, Medical Treatment & Health Industrial Park, new materials industrial park, equipment manufacturing industrial park, and Nengda business district, Nantong Free Trade Zone, Urban-rural Commercial Zone and Suzhou-Nantong Sci-tech Industrial Park will be improved. By vigorously promoting infrastructure, improving support facilities, intensifying attractive industrial investment, the development zone will turn these industrial parks into new exploration platforms, investment carriers and characteristic brands of the development zone. Qinghua Tongfang LED project will be taken as the leading company to accelerate the electronic industrial park construction. The principle of “unified planning, overall development, approving projects in stages, and implementing them in phases” will be followed to propel the construction of Nengda business district . A large-scale comprehensive service for functional zone integrating administrative office, business office, financial trade, commercial service, recreational entertainment, and high-grade residential quarter will be established. The development zone is prioritizing the protection of the environment. eco-park construction has been improved and resource conservation and environment protection are strenthened. A green economy will be developed. The development zone will actively promote the green economic model featuring circular economy and low carbon economy. A new pattern for industrial development with low consumption and little environment pollution will be advocated. An energy saving and emission reduction program will be put into practice. Ecological protection will be enhanced. Wide areas will be planted with trees. Tianxingheng River and Sutong Bridge will be taken as a green framework.An urban expressway afforestation project will be promoted to beautify the ecological environment.